BX795 is a potent and specific PDK1 inhibitor with IC50 of 6 nM, 140- and 1600-fold more selective for PDK1 than PKA and PKC in cell-free assays, respectively. Meanwhile, in comparison to GSK3β more than 100-fold selectivity observed for PDK1. (A) Washed human platelets were untreated or pretreated with the PDK1 inhibitor BX-795 (1 μM) for 5 min, and this was followed by stimulation with 2-methylthio-ADP (2MeSADP) (50 nM) under stirring for 5 min. Western blots were then probed for phosphorylated Akt (Thr308), Akt (Ser473), glycogen synthase kinase 3b (GSK3b) (Ser9), mitogen-activated protein kinase kinase 1/2 (MEK1/2) (Ser217/221), extracellular signal-regulated kinase 1/2 (ERK1/2) (Thr202/Tyr204), and cytosolic phospholipase A2 (cPLA2) (Ser505). The western blots shown are representative of three independent experiments. BAY 11-7082 is a NF-κB inhibitor, inhibits TNFα-induced IκBα phosphorylation with IC50 of 10 μM in tumor cells. Also inhibiting components of the ubiquitin system. Immunofluorescence images of Ishikawa cells showing the increase in the nuclear colocalization of ERa (red) and p65 (green) after E2 incubation. Nuclear colocalization is yellow. Treatment with ICI 182,780, PDTC or Bay inhibited the nuclear localization of both ERa and p65. Blue, DAPI-stained nuclei. All pictures were obtained the same day using the same microscope settings. Original magnification 3200, bar =50 um. Arrows, cytoplasmic ERa and p65 staining. ICI, ICI 182,780; Bay, Bay 11-7082. 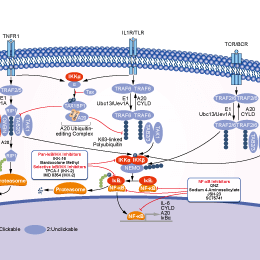 IKK-16 (IKK Inhibitor VII) is a selective IκB kinase (IKK) inhibitor for IKK-2, IKK complex and IKK-1 with IC50 of 40 nM, 70 nM and 200 nM in cell-free assays, respectively. Reduction in IFN-g production in TcREG by IKK-16 coincides with decrease in T-bet and Eomes expression levels. Flow cytometry plots showing cellular analysis for T-bet and Eomes in CD45+CD3+CD8+ population. TPCA-1 is an inhibitor of IKK-2 with IC50 of 17.9 nM in a cell-free assay, inhibits NF-κB pathway, exhibits 22-fold selectivity over IKK-1. GAB2-induced chemokine expression is dependent on IKKβ-NF-κB activity. (a) Effect of small-molecule inhibitors against PI3K (GDC-0941), PI3K/mTOR (BEZ235), MEK (AZD6288) or IKKβ (TPCA-1, IKK16 and Bay 65–1942) on CXCL1, CXCL2 and CXCL8 mRNA levels in GAB2-overexpressing FTSECs. Cells were treated with 2 μm of each inhibitor or DMSO control for 6 h before collected for quantitative PCR analyses. Data are averages±s.e.m. of four independent experiments. Comparison between DMSO- or inhibitor-treated GAB2-overexpressing FTSECs were used for statistical analyses. n.s., not significant; *P<0.05; **P<0.01. (b) Effect of suppressing IKKβ (encoded by IKBKB) or NF-κB p65 (encoded by RELA) on CXCL1, CXCL2 and CXCL8 mRNA levels in GAB2-overexpressing FTSECs. Cells were infected with a control shRNA targeting LacZ or shRNAs targeting IKBKB or RELA and cultured for 48 h before collected for quantitative PCR analyses. Data are averages±s.e.m. of three independent experiments. *P<0.05; **P<0.01. IMD-0354 is an IKKβ inhibitor and blocks IκBα phosphorylation in NF-κB pathway. (C) ELISA showed that the elevated IL-8 was significantly inhibited in HUVEC-shCD109 when pretreated with SB525334, LY294002, or IMD 0354. GAPDH served as a loading control for WB. Data shown as mean ± SD were from triplicates of three independent experiments. **P < 0.01 by t test. CM, conditioned media; NC, negative control. Wedelolactone, a medicinal plant-derived natural compound, is an inhibitor of IKK that is critical for activation of NF-κB by mediating phosphorylation and degradation of IκBα. Bardoxolone Methyl is an IKK inhibitor, showing potent proapoptotic and anti-inflammatory activities; Also a potent Nrf2 activator and nuclear factor-κB (NF-κB) inhibitor. Renal Nrf2 activity was shown in RTA402-treated acFSGS (RTA402 + acFSGS) mice as early as day 7 (RTA402 + acFSGS) and persisted to day 28, compared to vehicle + acFSGS mice. Kidney in situ ROS production demonstrated by DHE detection. BMS-345541 is a highly selective inhibitor of the catalytic subunits of IKK-2 and IKK-1 with IC50 of 0.3 μM and 4 μM in cell-free assays, respectively. (E) After transfection with control or catalase siRNAs for 24 h, A375 and G361 cells were treated with vehicle or 2.5 µM BMS-345541, 20 µM PS-1145 and/or 50 µM of fotemustine for an additional 48 h. Cell viability was then assessed. *, p<0.05. (F) A375 and G361 cells were treated with vehicle or 2.5 µM BMS-345541, 20 µM PS-1145 and/or 50 µM of fotemustine, in the presence or absence of catalase inhibitor 3-Amino-1,2,4-triazole (ATZ, 50 µM) for 48 h. Cell viability was then assessed. *, p<0.05. SC-514 is an orally active, ATP-competitive IKK-2 inhibitor with IC50 of 3-12 μM, blocks NF-κB-dependent gene expression, does not inhibit other IKK isoforms or other serine-threonine and tyrosine kinases. Mesalamine is a specific inhibitor of TNFα-induced IKK activity, used to treat inflammatory bowel disease. BAY 11-7085 is an irreversible inhibitor of TNFα-induced IκBα phosphorylation with IC50 of 10 μM. VSMCs were pretreated with BAY 11-7085 (BAY, 10μmol/L) for 1h and further treated with or without 10-7mol/L salusin-β for 30min. A, Cytoplasmic extracts (Cy) were obtained and the phosphorylated IκBα, IκBα and HDCA3 protein levels were measured by western blot analysis. B, nuclear extracts (Nu) were obtained and the nuclear p50, p65 and HDAC3 protein levels were measured by western blot analysis. Data are expressed as means ± SD (n=3). *P< 0.05 versus the control with no treatment; #P< 0.05 versus 10-7mol/L salusin-β treatment alone. Dehydrocostus lactone (DHE), a natural sesquiterpene lactone, inhibits IKKβ activity, IκBα phosphorylation and degradation, coactivators p300 recruitments and p50/p65 NF-κB nuclear translocation, and their DNA binding activity on COX-2 promoter. It has anti-inflammatory, anti-ulcer, immunomodulatory and anti-tumor properties. AZD3264 is a novel IKK2 inhibitor. (C) G361 cells were loaded with DCF (ROS probe) and further stimulated with vehicle or indicated IKKβ inhibitors for 3 h. Fluorescence was measured using a fluorescence microplate reader. *, p<0.05 versus control. LY2409881 is a potent and selective IKK2 inhibitor with IC50 of 30 nM, >10-fold selectivity over IKK1 and other common kinases. PS-1145 is a specific IKK inhibitor with IC50 of 88 nM. MRT67307 is a potent and dual IKKϵ and TBK1 inhibitor with IC50 of 160 and 19 nM, respectively. Rosmarinic acid (RA) is a naturally occurring hydroxylated compound. It has the ability to block complement fixation, inhibit lipoxygenase and cyclooxygenase activity and inhibit the expression of CCL11 and CCR3 by suppressing the IKK-β activity in NF-κB activation signaling. WS3 is a β cell proliferation inducer via modulation of Erb3 binding protein-1 (EBP1) and the IκB kinase pathway. WS6 is a β cell proliferation inducer via modulation of Erb3 binding protein-1 (EBP1) and the IκB kinase pathway.